Car bomb kills 22 near presidential palace. A truck bomb has exploded outside a hotel in Somalia’s capital, Mogadishu, killing 22 people in a heavily secured area close to the presidential palace. The al-Shabab group, which is affiliated to al-Qaeda, says it is behind the attack. A security conference was under way at the hotel on Tuesday morning at the time of the blast. 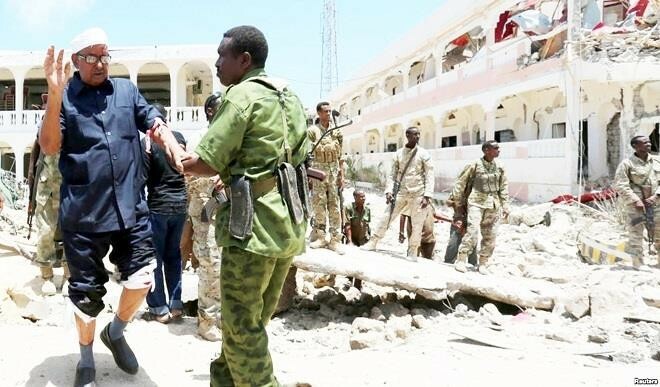 “Security forces tried to stop the bomber who used back roads before he sped through checkpoints near the presidential palace and detonated the bomb,” the Associated Press news agency quotes police officer Col Ali Nur as saying. Dr Abdulkadir Haji Aden, head of Mogadishu’s ambulance service, said that 22 people had died in the hotel blast and more than 30 were injured.